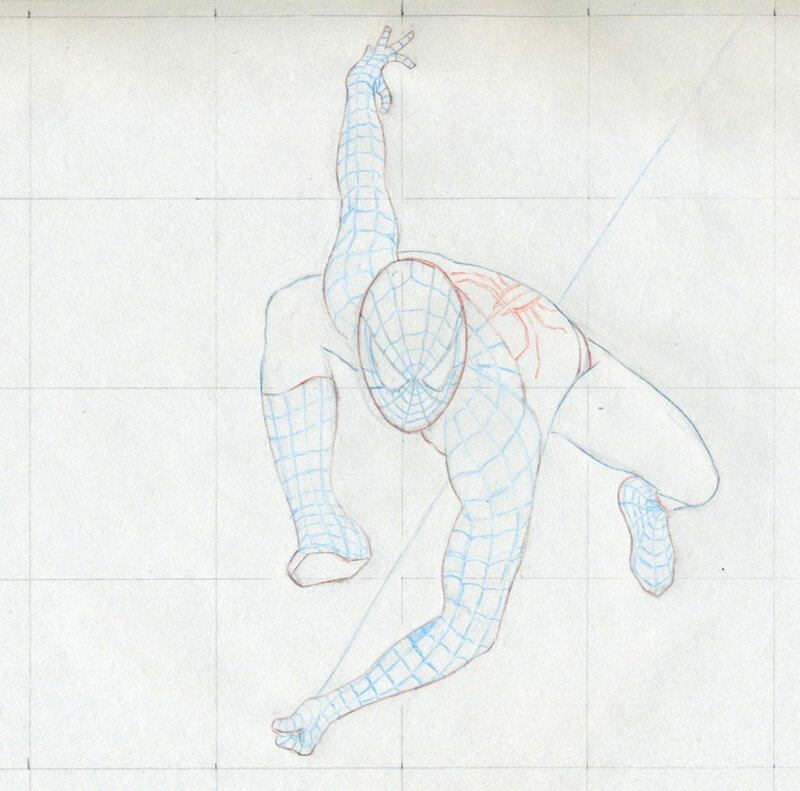 Let’s draw spiderman in action. 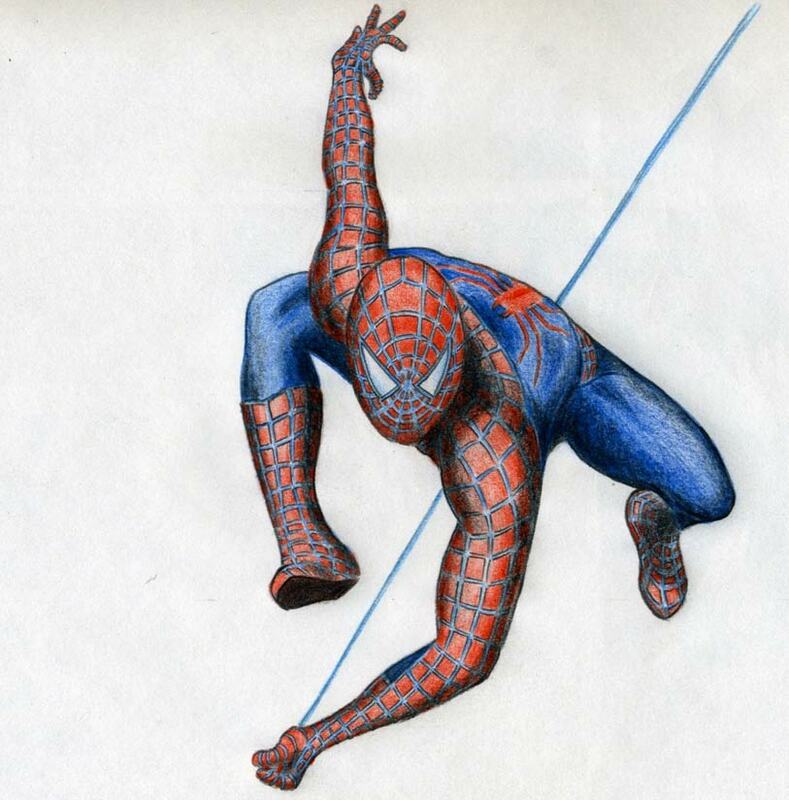 I know you love the spiderman movie or cartoon. That’s why you are here. 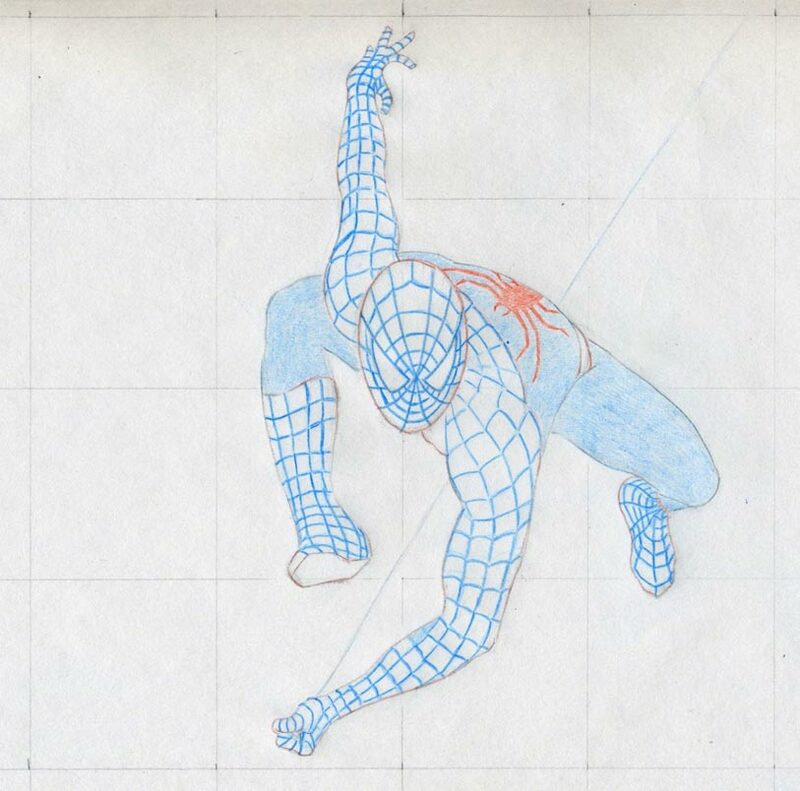 I think this action pose would fit the best for the drawing exercise. It may appear “difficult” at first sight but I assure you it is easier than you think. 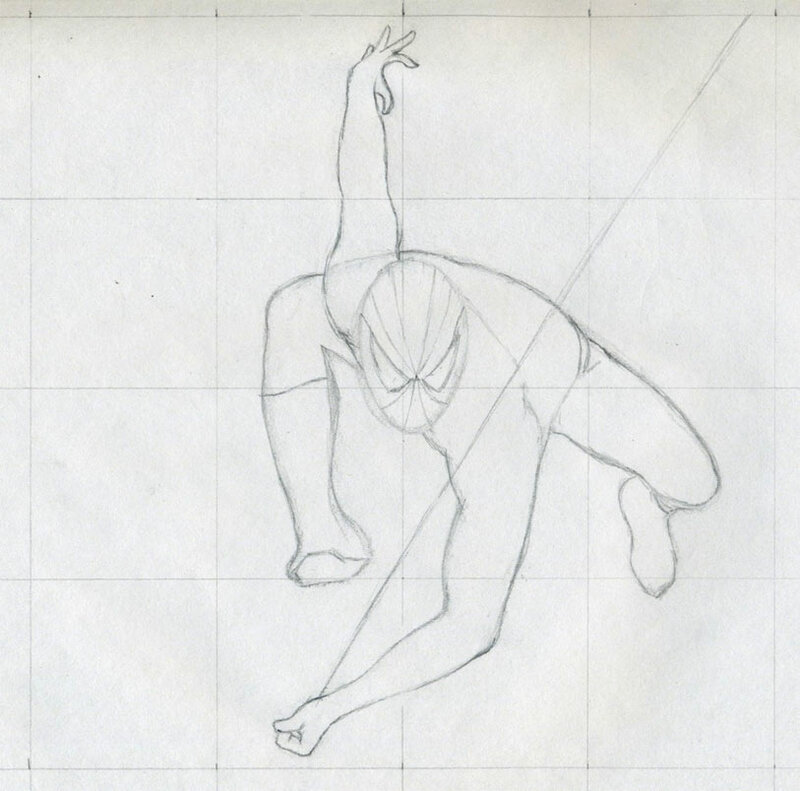 In order to make it even easier, I prepared a grid, so that you can capture the basic outline contour as perfectly as possible. See, the possible difficulty that you may have been considering was this flying pose. 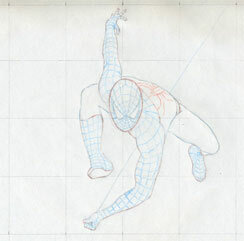 On the contrary, to draw spiderman in this pose is easier than any other. Draw 4 x 4 equal squares as you see on this picture. It doesn’t matter how big or small the squares are. What matters is, that these squares are equal. 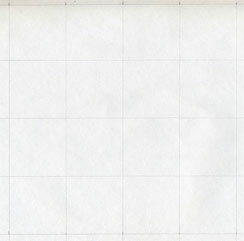 The size of the squares will determine the size of your finished drawing. 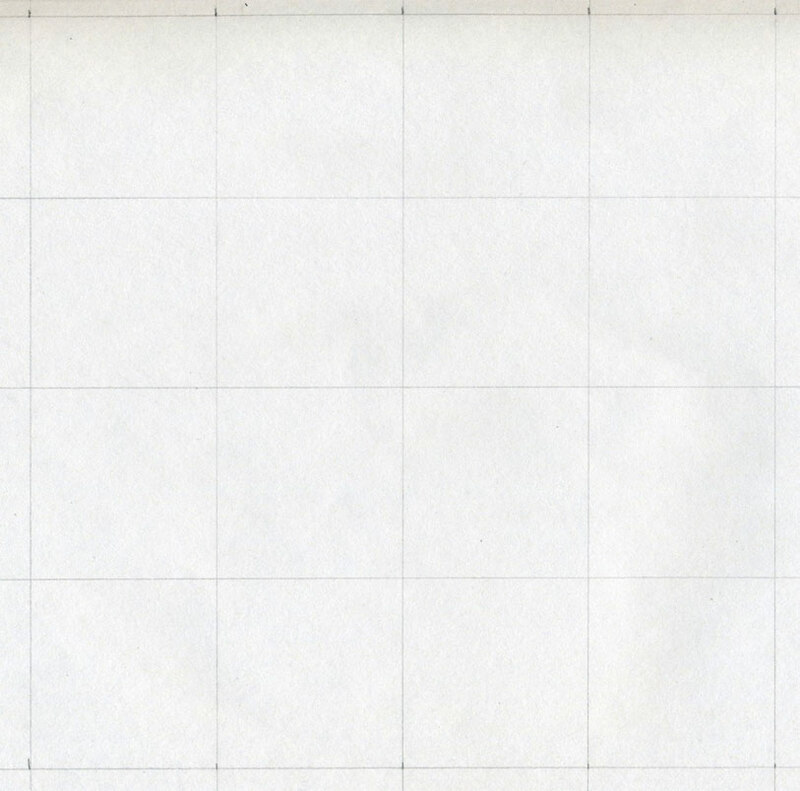 If you have a photo printout, you can draw a similar grid on it. 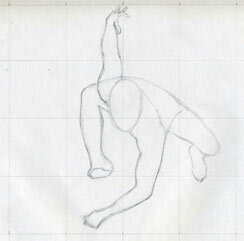 Observe well the finished drawing or photo and see where the body contours cross the grid lines. Those points are very important. 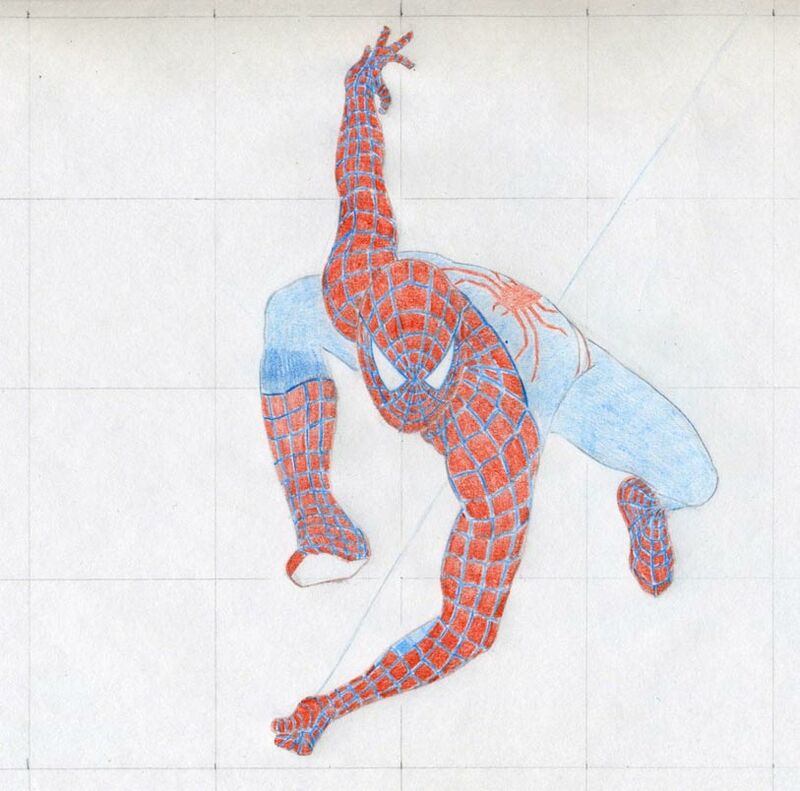 To draw spiderman as precisely as possible, you want to capture those points as precisely as possible. 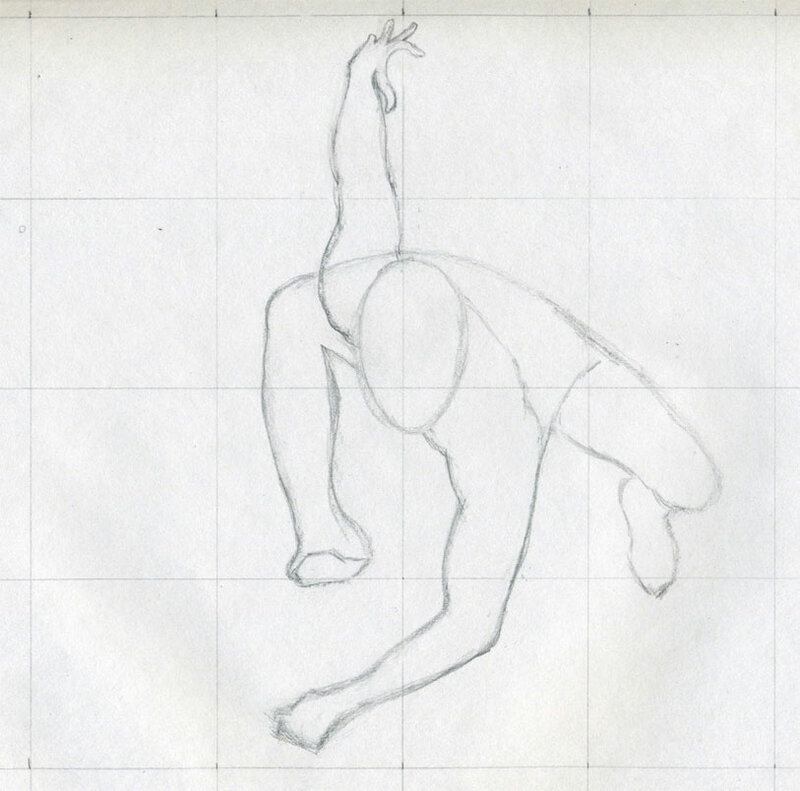 Sketch an approximate body contour. Be easy about it. We’ll correct all mistakes on the go. Notice, how I outlined both hands. Lower hand is only symbolic; fingers are not ready yet. The upper hand has fingers sketched only very roughly. Here I corrected the fingers and sketched the missing ones. Sketch the string by which spiderman can jump over the buildings. You can outline the eyes and the cobweb pattern on his face. 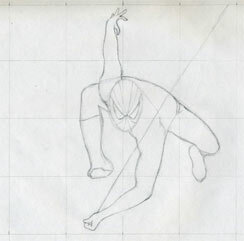 Here you are going to finalize the body contour. 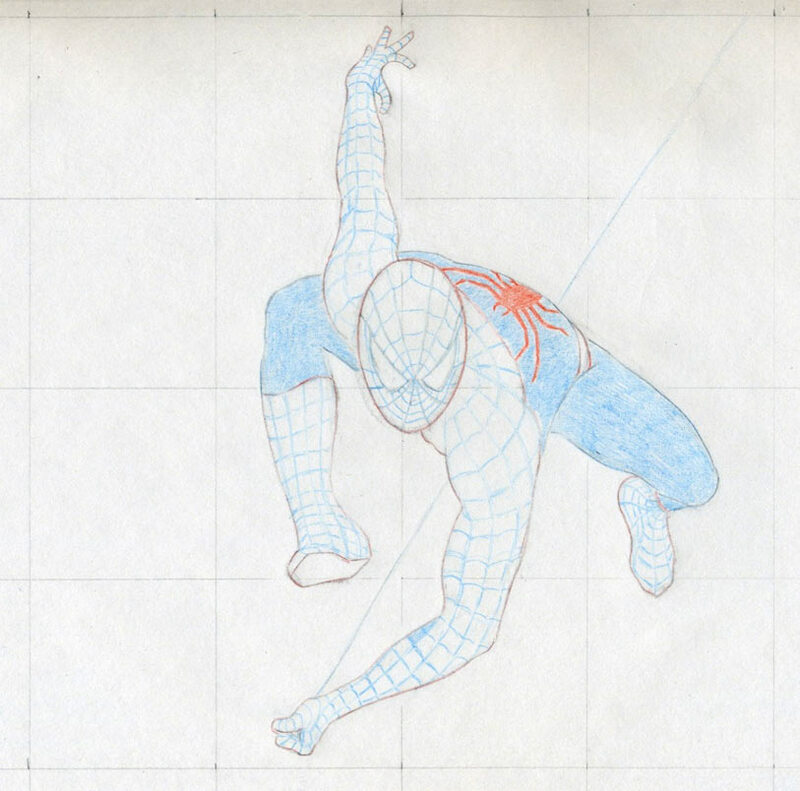 You’ll need two color pencils, blue and red to outline the final shape. Over the original pencil sketch, outline the final body outline contour in color pencils. Red part in red and blue part in blue. 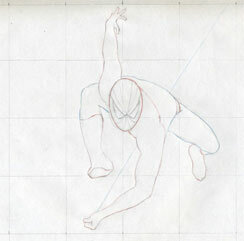 Only the color pencil body contour remains, after you erase the initial graphite pencil sketch. 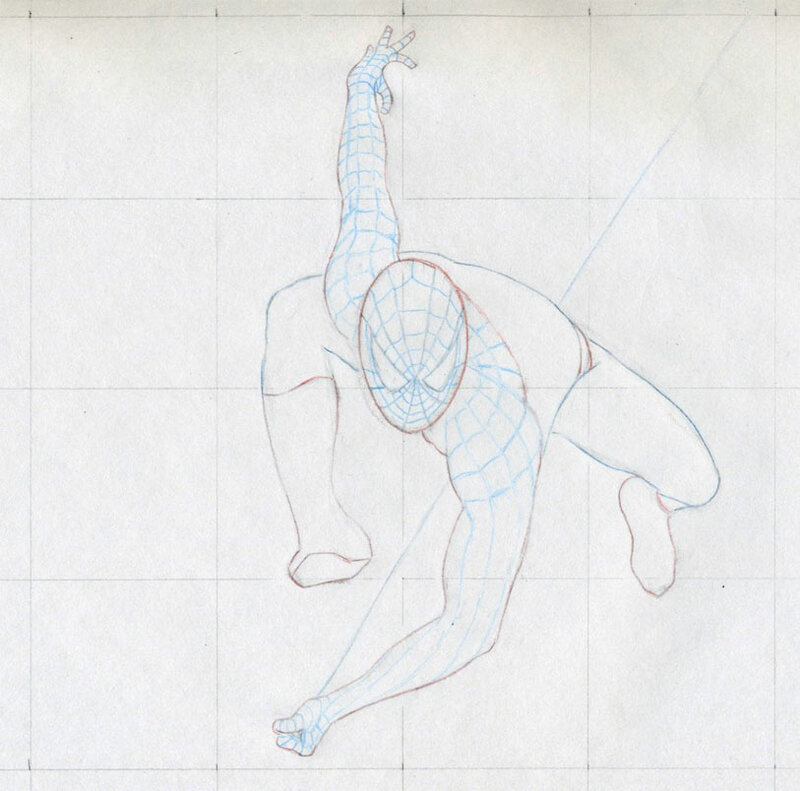 Using this clear and exact body contour you can continue to draw spiderman easily and almost effortlessly. You have now created a perfect template. Begin to outline the cobweb pattern on both of spiderman’s arms and face. Do it by light blue color pencil. 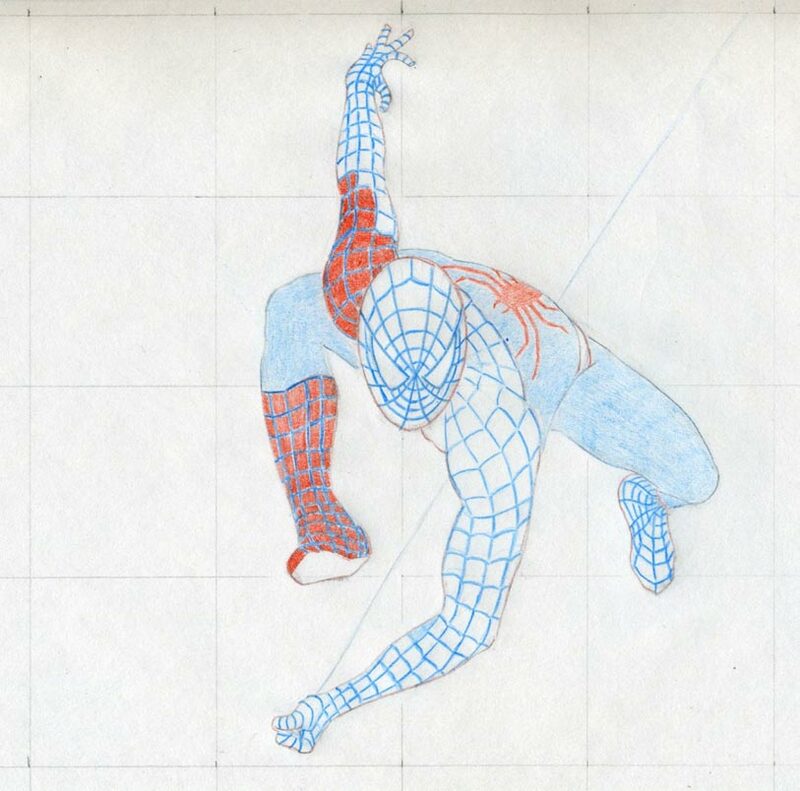 Continue to outline the cobweb pattern on his boots. 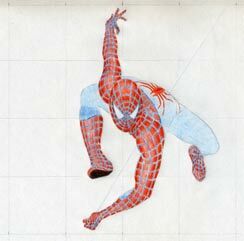 Do not forget to outline the red spider on his back. Color the legs by the same light blue color pencil you have used for cobweb pattern. No shading yet, only flat color. 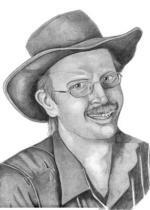 You are making the basic coloring on which you will add (build) the darker color tones and make necessary shading. 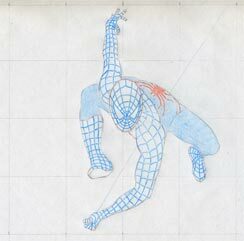 Continue by darkening the cobweb pattern by the same light blue pencil, e.i., push the pencil a little more. Make sure the lines you make are precise and final. Avoid any corrections by using eraser here if possible. 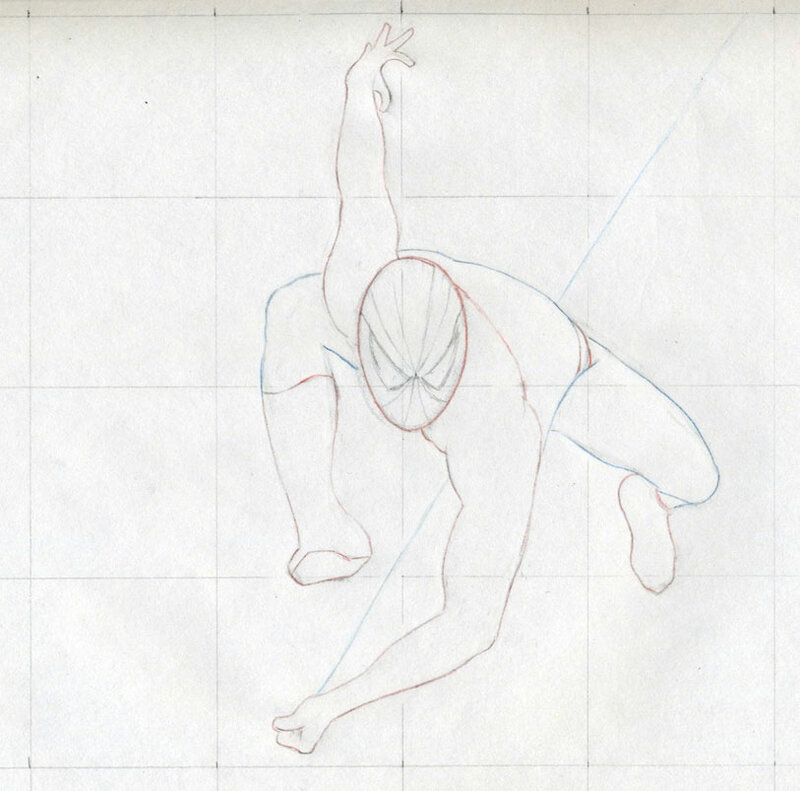 You have made the basic necessary outlines to draw spiderman perfectly. 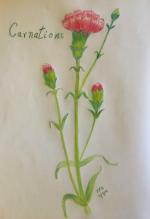 Begin coloring the red part. This will be a little detailed work because you have to fill up each square of the cobweb pattern by leaving the blue cobweb untouched. First, fill up the red part only in flat light red color. Put more red color to the spider sign on his back and begin shading the arms, the head and the boots. Again, only by coloring each square separately. 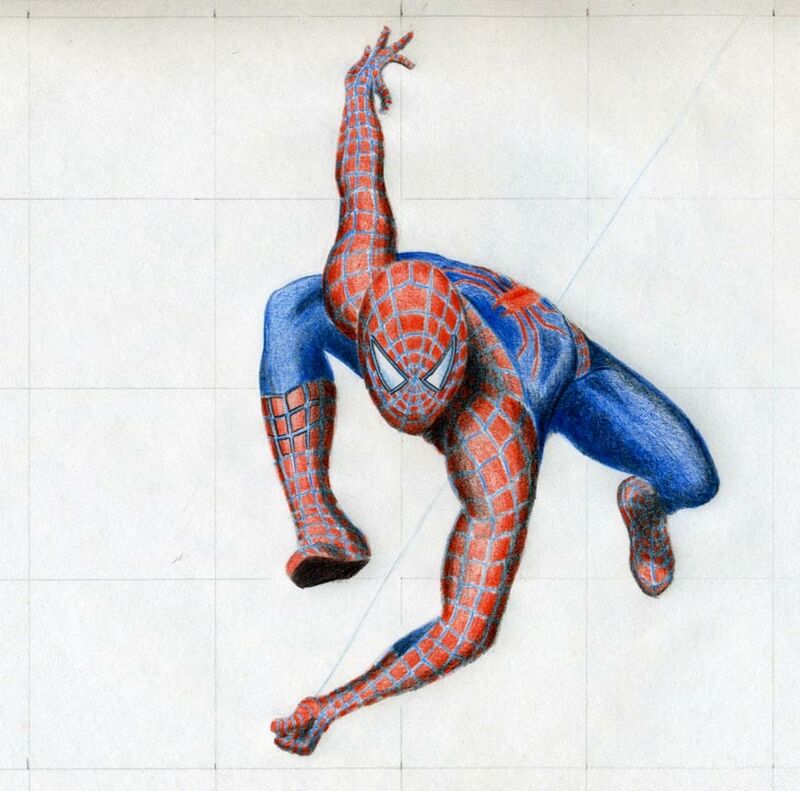 Now you’ll need a dark blue pencil to shade the blue part. Notice how the muscles are well visible. To draw spiderman as realistic as possible, one of the key points to concentrate is his masculine athletic body. 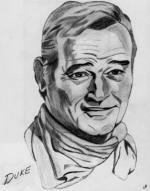 If you decide to continue the drawing you’ll need one black color pencil. Not a graphite pencil. 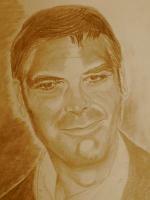 By black color pencil add more shade on those parts of the body that were not possible to darken by red or blue colors. Especially the area around neck, arms and the boots. Here you simply add black color very gently over the red or blue color and over the cobweb pattern. However, the original basic red color will become a little darker. Now, take a softer graphite pencil, any intensity from B3 to B6, and sharpen it well. 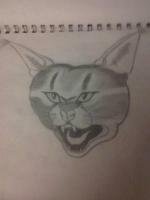 A mechanical pencil will do the job well. Re-contour the cobweb pattern and see the difference. One of the past pieces is the blue color string. It consists of several strings so you can use light blue for basic coloring and one thin line by dark blue color. 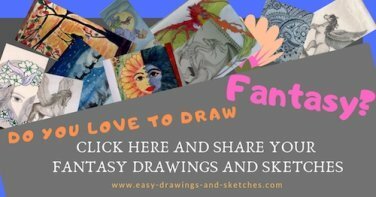 Sketch the string by free hand only. Do not use ruler! Erase the remaining grid lines.